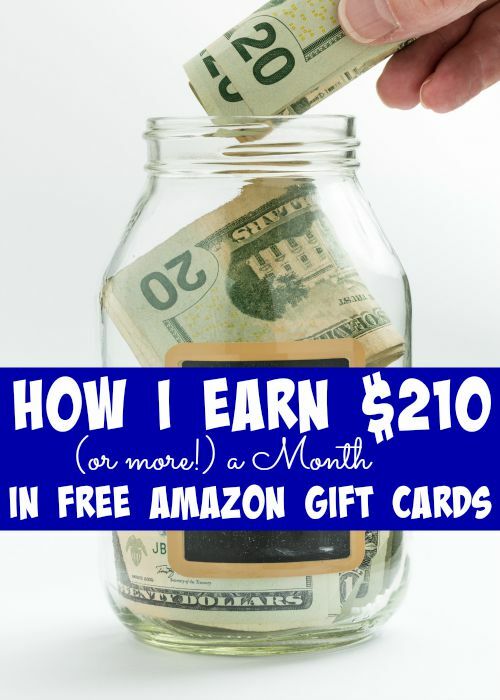 I want to share how I earn $210 a month in Amazon Gift Cards. I have shared the sites I use including my list of 45 Places to Earn Free Amazon Gift Cards. But I want to share what my typical day looks like, and how I can earn this much EVERY month. It is a huge help towards my grocery budget and my overall budget it helps me snag many items free! I spend less than 30 minutes a day to earn and in most cases I earn more than $210 a month that comes out to an average of $14 an hour! Not bad! First I run Perk all day and all night I run it on my tablet and 2 of my old phones. I also recently bought a Nokia Lumina with my Amazon Gift Cards for only $29.99! Perk is an App that allows you to watch videos (like commercials) in exchange for points. You earn 4 points for every 2 videos. You can earn about $1 a day on these videos if you stay on top of them. Once an hour a pop-up comes up asking if you are still watching. Clicking yes continues the videos. To maximize my earnings, I watch the app trailer videos. They are the shortest. I earn about $2 a day if I do NOTHING else on Perk. But I also Use their search app and earn up to 100 points for a search. They also have a browser app to earn while your view the internet, A scratch card game and a Pop Quiz game as well. Plus if your download the wallet app you can get a discount on your Gift Cards you redeem. You can also earn points for shopping online. With Perk, I earn about $75 a month. First thing in the morning I get up (after feeding the kids and all) and I start on Swagbucks. I only do Swagbucks enough to reach my daily goal. I do this by starting with the Daily Poll, The NOSO offer, the Encrave Offer, and the toolbar offer. This is 5 Swagbucks. I will then use Swagbucks Video App to reach my goal. This takes less than an hour each day. You will earn bonuses for reaching your goal each day and for also doing your goal every week. I will also cash in any swag codes that come out (Swagbucks notifies you via the App or the Toolbar) and I use Swagbucks for search on my computer. I will earn about 3,000 Swagbucks a month or about $30 in Amazon Gift Cards. So I am up to $105 for the month. Once I am done with the Swagbucks Videos on my Phone I will switch it over to run Perk Videos for the Day. GiftHulk this is a site just like Swagbucks, I do my bonus bar point each day if I'm feeling up to it I will do more. This earns me $30 a month. This takes my monthly total to $135. Then I open a Tab in Reward Shopping and use their stumble feature. Every time you earn stumble points it’s about 25 points. I do this throughout the day and earn about $10 worth of Gift Cards a month. Taking my monthly total to $145. For some extra cash, I use Quick Rewards. They are pretty much like InstaGC. Do videos offers and more for cash. This one my earnings are directly affected by how much effort I put into it, and how much effort I put in depends on much extra cash I need to make that month. I have done everything from $5 – $100 for Christmas. As a bonus, I will also score discounted Amazon Gift Cards from Gift Card Granny to save money on items I need. Make sure to check out Amazon Prime Perks – 30 Hacks to Save With Your Amazon Prime Membership for ways to make those gift cards stretch as much as possible. Special K® Red Berries Making Women Feel Good! Thank you for all of your tips. I downloaded Perk and was running the trailers. It wouldn’t let me earn more than 100 points. Is there a max you can earn a day or am I doing something wrong? Since pretty straight forward. Have you verified your account? I haven’t’ received any limits on mine and I earn more than 100 a day. Do these Perk apps still work for you??? Perk is definitely the way to go for earning Amazon Gift Cards! At the moment, I have two Android phones dedicated to running Perk. An LG Optimus Zone 2 and a Samsung Galaxy Rush, which was entirely purchased from Amazon Gift Cards that I earned online. If you are running the videos on your phone, what about the data charges on you cell bill? Or how do you get around that? I have my phone hooked up to my wifi at house, i do not run the video unless hooked up to wifi! Any tips on how to make the most out of zoom bucks? I know you said its just like swag bucks, but I find swag bucks much easier to use. I do mostly Videos and Games with them, sometimes the crowdflower tasks. I have tried using swagbucks before and have found that making sure you get credit for things can be hard if you have a problem during the process and there is no way to go back and try again it tells you that you have already completed it. The rest of the apps are new to me. So far I get Perks but what is the difference between the green and yellow coins? I have also had trouble with Superpoints stumble feature could you explain it in more detail. Swagbucks app was tricky but I have never had a problem online tracking. Make sure you clear your cookies before doing an offer. Perk the green coin (points) are redeemed for rewards. The Yellow coins (tokens) are used to games, to big on auctions in the prize mob app ect. Superpoints stumble rewards point randomly 🙂 I have found some great articles ro read while stumbling! When you’re using Perk on multiple devices, are you logged into the same account or do you have differant ones? I log in to the same account You can have up 5 devices per account. Hi, Danielle! I was wondering if you have a referral code for Perk…? I earn about 2500 points a day. Like I said I used 3 phones so I earn about 400 points a phone. I do some sign ups that are easy to that cuts down on the amount of videos i have to watch. Busy months like last month I only made $50. If my arithmetic is correct, you’d need to be earning 2,500 points per day to make 75,000 points per month to equate to $75 of actual amazon gift card money each month. Is it really that simple to hit those daily goals with just earning 2 points per video? That means having to watch 1,250 running on your devices per day. I’m trying these things you suggest but just not seeing my point counter go up enough each day to equate to any worth while earnings. From what I am reading, I think you are talking about Perk? I watch videos on a 3 phones (mine, Hubbys and my old phone) and I also do some fo the offers and of course play some of their games 🙂 It’s all about how active you are. Gifthulk is it a site for smartphone users? I don’t have a smartphone so can’t do a lot of the ones u have listed. I am with swagbucks and love it. No, I do all of my gift hulk stuff online. What is your gift hulk invite code? So does this money go straight into your Amazon account? Or into your bank account? I get it in the form of Amazon Gift Card which I apply to my account. I use them to buy things like diapers and groceries that would normally come out of my budget. I take it a step further and what I save with the Amazon Gift Cards I put into savings. Thanks for the tips, I also use swagbucks, instagc and shopkick. Some other good sites are inboxdollars, sendearnings, mypoints and rewardtv. Another app I’ve used is tap cash. Again it all depends on your activity with them so what you earn will vary each time and for each person. Also wondering if you could send me a referal to perk gifthulk, superpoints and quick rewards that way you could earn more rewards. Found this through Pinterest. Are your other phones that you run these videos on …..on your cell phone plan?? Just wonder how costly it is if you do have all three devices on your cell phone. No they are not they run strictly on wifi. Most smartphone will run if you have wifi even facetime! How do I know what smart phones will run off just Wifi? The reason I am asking is because Walmart has some prepaid phones that are cheap. I didn’t know if it had to be a no contract phone or if it could be a prepaid phone? Any phone what has wifi capabilities can run off od just wifi. You can get a prepaid phone (make sure you will be able to download the apps) and just don’t buy the reload cards. Get it home set up and hook to your wifi. I use a Windows Phone like this I got it for $20 on a sale around Black Friday. On Superpoints you say you use the Stumble feature.. but I cannot locate it. Can you tell me where it is? They have rebranded and haven’t seemed to move the stumble feature over. I Clicked your Gifthulk Link and it doesn’t give your referral code! I just tried to signup for Swagbucks using 2 of my email accounts and I’m getting messages that say an account already exists, which doesn’t seem possible since I’ve never joined/never heard of it until now. Then when I try the forgot password, it says no email/account exists…suggestions? Have you tried to connect with facebook? That’s what i do it makes it easier. But it sounds like a site issue maybe wait a day then clear you cache and try gain. Which Perk app/s do you use to run all day? There are several. 🙂 Thanks! Thanks, Danielle, for the great advice! I just started doing what you suggested. I haven’t had much luck with the surveys. Some of them can have you answering questions for 20 mins only to tell you that you don’t qualify :/ Have you had to change up your routine or found new apps that help you get points faster? I noticed the Swagbucks has replaced the NOSO Offer with Daily Goal, and I haven’t quite figured out the Swag Codes. I’ll get a notification on my phone but when I click on it I don’t get a code. I’ll ask their support about that one. I switched from doing the surveys to doing the tasks they offer via CrowdFlower. Once you get the hang of them they are super fast! Everything on most of these earning sites want your email to earn the extra points. That really messes up your email account with so many mails. Any advice? This is very interesting and I do see how it works. But I am curious. If you had to give a time frame – how much time out of your day does it take? I also noticed you mentioned missing out or forgetting some steps or taking advantage of bonuses. Does that happen often. I am forgetful and I could see myself forgetting to do a lot. Superpoints is RewardsShopping and I just do the Super Lucky button clicks each day. On Swagbucks, I try to do one Gold survey a day to help meet my daily points goal. I found that watching the videos quickly uses my GB limit. I run Perk videos on my Kindle. iRazoo is another site. Virtual and iRazoo all have daily codes like Swagbucks that earn points. iRazoo does require you to do a offer each day before redeeming the code. I like to redeem my points for PayPal cash when possible. That should say Gifthulk, not Virtual.